By the late 1880s, tribes across the West, including South Dakota, were confined to the reservations and living in bleak circumstances. Then, a Paiute from Nevada named Wovoka offered these desperate people hope. Representatives from all over the West traveled to Nevada to meet with the holy man. They returned to their tribes with the message and with the Ghost Dance. Wovoka foresaw an apocalypse, followed by a renewed and healed earth, without the white man. Indian ancestors would rise from the dead - thus the name "Ghost Dance" - free to roam the earth along with the living, without boundaries amid plentiful food and game. To bring about this change, the Indians had to give up their evil ways. Cleansing, meditation, chanting and dancing were part of the ritual. Those who danced would be spared the coming apocalypse, suspended in the air while the earth - and the white man - were covered with new soil. The new religion contained many Christian elements - the concept of the Messiah, life after death, giving up sin, redemption and renewal - and some advocates reported seeing visions of Jesus. But this new religion, which foretold the end of the white man, caused many settlers and government officials to panic. Citizens, newspaper editors and other community leaders pleaded with the government to protect them. In South Dakota, the governor authorized a "Home Guard," a collection of local citizens who attacked Indian groups several times in these tense times. Chief Big Foot’s band, destined for the tragic encounter with the U.S. Cavalry at Wounded Knee Creek, was active in the new religion. The group, on the Cheyenne River Reservation in central South Dakota, was made up mostly of widows and relatives of dead warriors who hoped to bring the men back. Further north, on the Standing Rock Reservation, Sitting Bull feared the Ghost Dance would cause further bloodshed, but, according to some reports, he was assured that Ghost Shirts, painted with magic symbols, would repel bullets. The new religion, a beacon of hope for the suffering tribes, instead led to fear, hysteria and violence. 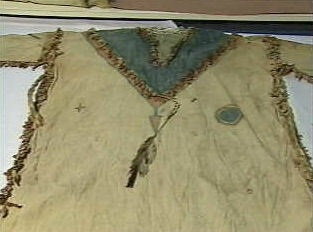 Sources: "Lost Bird of Wounded Knee: Spirit of the Lakota," www.PBS.org/WETA/TheWest, "Ghost Dance" by Dr. Karen M. Strom.